There are hopes that a cease-fire could end the fighting in Yemen’s civil war. But a visit to the front near Hodeida shows that even if the violence stops, it will be difficult to keep the country together. Fighters with the Tihama Resistance forces travel towards the frontline in Hudaydah, Yemen, Nov. 18, 2018. The Tihama Resistance forces are a local group within the coalition fighting the Houthis. The Houthis, originally from Nothern Yemen, held major parts of the country until they were pushed back by teh Southern alliance backed by Saudi Arabia and the United Arab Emirates. The Tihama Resistance hails from the Tihama Plain, the most impoverished part of one of the poorest countries on earth. They fight for either independence or an equal seat at the table in a unified Yemen, adding to the diverse and often conflicting goals of the alliance against the Houthis. Even from a distance, the contours can be seen jutting out of the yellow-gray desert: mortar-riddled walls, sandbags on half-destroyed roofs, wrecked cars. A house with an interior of blue tiles has been stripped naked, its exterior walls largely destroyed but for the concrete pillars. A gas station sits unscathed in the middle of the ruins. It has no gas to sell, but still. It’s the last intersection before the battlefield, and its name could hardly be more misleading: al-Gabalayah, “the mountainous.” The Tihama plain, which extends for hundreds of kilometers from north to sough, stretching flatly between the Red Sea and the shimmering mountain ranges of southwestern Yemen — scorched, forgotten land. This is where the most important front line in the war is to be found. Located 30 kilometers (18 miles) to the north, Hodeida is the only port city in the hands of the Houthi rebels — and it is also where 80 percent of all international aid deliveries and two-thirds of food imports for all of Yemen arrive. These goods are essential for survival in a country that has to import 90 percent of all its food, and the Houthis profit handsomely, earning tens of millions of dollars through import duties each month. For months, the mercenary army belonging to the coalition led by Saudi Arabia and the United Arab Emirates (UAE) has besieged the city, which is still home to around a half-million inhabitants. 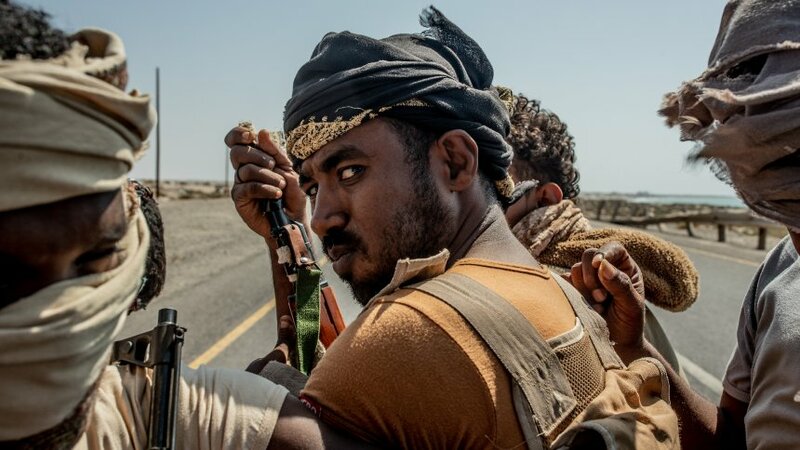 During the last offensive in November, they advanced into the city, carrying out airstrikes against the Houthis with combat helicopters and fighter jets. Within 24 hours, 150 people had died. According to statements made by the coalition, the aim of the battle for Hodeida is to restore power to the internationally recognized government of President Abed Rabbo Mansour Hadi. Why not be honest and state that the ‘fragmentation of Yemen’ was really the aim of the whole conflict. Iraq should be fragmentated, Syria should be, Libya should be, Sudan, etc. … Aim achieved here and there, right? As I say many times that there is NO permanent peace in Islamic countries as long as KSA and IRAN still reject Human Right. This is a main problem in Islamic countries. Also as long as the leaders of KSA AND IRAN are the extremist Islam or Muslim there is NO permanent peace between KSA and IRAN and its allies. There is no permanent peace in Islamic Countries as long as the CIA and MOSSAD continue its meddling, spreading out weapons and forcing the oil-Arabs to come up with cash. Yes, of course, just because weapons ‘appear’ does not mean, we should kill each other, but such is life if we do not accept the guidance of the Khalifa of this time. If KSA and IRAN has a strong friendship as Muslimbrother, no one can middle or devide it. Please do not always blame others, blame our self! Allah say: you reap what you sow.